Rev. 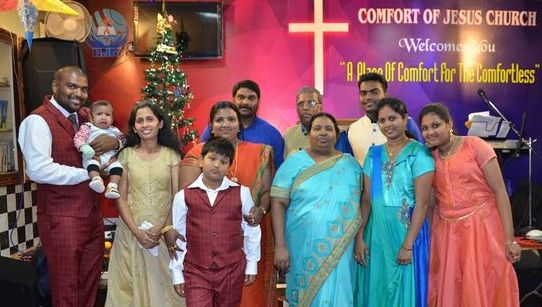 K.Paul Jabaraj is the Founder & Senior Pastor of " Comfort of Jesus Church. He was born in the year 1953 in a Hindu mudaliyar family in Chennai , India . He was brought up in worshiping the Idols from his childhood. And even he trusted in those idols except the true Savior Lord Jesus Christ. He spent my teenage days in sinful life. He lost his peace and had the fear of future & Hell. In this situation a friend of him took him to a room and taught him a small prayer and that prayer changed his whole life. From that day onwards he found a change in his life ,that small prayer caught fire in his life . Then he understood clearly about Salvation, Lord's Mercy upon him, His blessings, & Heaven and Hell. Then he bought a Holy Bible and started to read it. Through the Bible and by many other God Servants God spoke to him and equipped him in the Word of God . Finally he accepted Lord Jesus as his personal Savior. From then onwards he got peace and the determination in his heart that God Jesus Christ forgave all his sins. In the year 1970 at the age of 17 he was baptized and started to follow the Lord's ways by receiving the Anointing of the Holy Spirit and started to serve Him. He has been in the Lord's Ministry from the age of 17 and Ministering God's Word all over India. In the early days of his Salvation he started preaching the Gospel in the streets of Chennai city. Some people accepted few of them rejected. After he received the Lord as his God, His parents kicked him out of the house because he received Jesus His personal Savior in his life. He spent most of the days in the streets without food and also slept many days in the church hall and with God's children premises who gave me accommodation during my early walk with God. In 1978 he received God's call and admitted himself fully for the full time ministry Along with the ministry he completed Bible Course. From 1980 to 1983 he was serving the Lord in Andaman and Chennai with his family. From 1983 to 1990 he was Pastoring a church in the rural areas of Andhra Pradesh city. From 1990 to 1996 he served as a Pastor in a church in Bangalore city. In the year 1997 God inspired me to start a ministry called Comfort of Jesus ministry to share God's comfort to the people are in Need and also we started a church with 10 believers but now we are more than 400 believers worshiping Him and receiving Comfort and peace through this ministry and he is pastoring the main church in Bangalore. Kindly pray for me and my ministry.